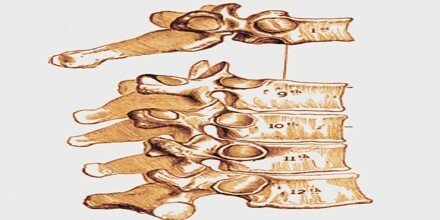 Thoracic Vertebrae are unique among the bones of the spine in that they are the only vertebrae that support ribs and have overlapping spinous processes. There are twelve thoracic vertebrae and they are intermediate in size between the cervical and lumbar vertebrae; they increase in size going towards the lumbar vertebrae, with the lower ones being a lot larger than the upper. The 12 thoracic vertebrae are situated between the cervical (neck) vertebrae and the lumbar vertebrae. The thoracic vertebrae are represented by the symbols T1 through T12. Its name “thoracic” is because of the twelve ribs making up the thorax that are joined, fixed or movable, to the twelve thoracic vertebrae. The thoracic vertebrae are concavely curved, towards the back of the body, which is called kyphosis. Apart from their mechanic role in supporting the body, these thoracic vertebrae ensure the protection of the spinal cord and every nerve emerging from the vertebrae that principally innervate the different areas of the thorax. Thoracic vertebrae are medium in size – larger and thicker than the cervical vertebrae above them, but smaller and thinner than the lumbar vertebrae below. The T1 vertebra is the smallest and closely resembles the cervical vertebrae, while the T12 vertebra is the largest and most similar to the lumbar vertebrae. The intermediate vertebrae all follow the trend of increasing size from superior to inferior as a result of the greater body weight supported by the inferior vertebrae. The vertebrae are separated by intervertebral discs of fibrocartilage, which are flexible cartilage discs located between the bodies of two adjacent vertebrae that allow movement in the spine and have a shock absorbing or cushioning function as well. In total, the adult human body typically has 23 discs, with the first found between cervical vertebrae 2 and 3, and the last one is found between the lumbar vertebra and the sacrum. Posterior to the vertebral bodies are thin bony rings known as the vertebral arches. Each vertebral arch surrounds and protects a hollow vertebral foramen that provides space for the spinal cord and spinal nerves. A pair of transverse processes extends from the lateral sides of each vertebral arch to support the ribs and provide attachment sites for the rotatores and multifidus muscles of the back. There are 12 thoracic vertebrae (denoted as T1-T12) found in adult humans, and they are situated in between the cervical and lumbar vertebrae, with a general sizing larger than the cervical but smaller than the lumbar vertebrae. 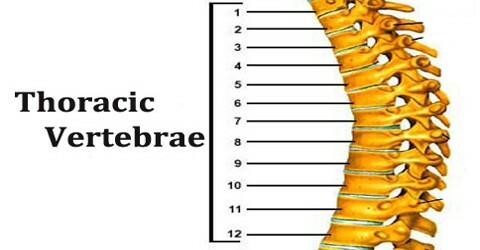 For each of the 12 thoracic vertebrae, there is a corresponding pair of ribs attached to them. First Thoracic Vertebra (T1): The first thoracic vertebra has, on either side of the body, an entire articular facet for the head of the first rib, and a demi-facet for the upper half of the head of the second rib. The body is like that of a cervical vertebra, being broad, concave, and lipped on either side. Second Thoracic Vertebra (T2): The thoracic spinal nerve 2 (T2) passes out underneath it. The second thoracic vertebra is larger than the first thoracic vertebra. Third Thoracic Vertebra (T3): The thoracic spinal nerve 3 (T3) passes out underneath it. 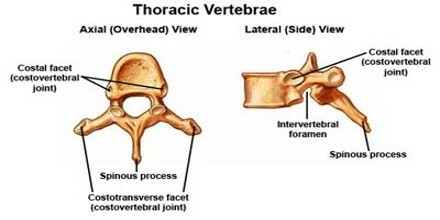 Fourth Thoracic Vertebra (T4): The fourth thoracic vertebra, together with the fifth, is at the same level as the sternal angle. The thoracic spinal nerve 4 (T4) passes out underneath it. 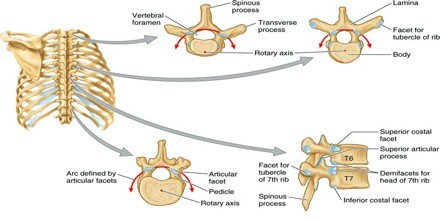 Fifth Thoracic Vertebra (T5): The fifth thoracic vertebra, together with the fourth, is at the same level as the sternal angle. The human trachea divides into two main bronchi at the level of the 5th thoracic vertebra, but may also end higher or lower, depending on breathing. Sixth Thoracic Vertebra (T6): The thoracic spinal nerve 6 (T6) passes out underneath it. Seventh Thoracic Vertebra (T7): The thoracic spinal nerve 7 (T7) passes out underneath it. Eighth Thoracic Vertebra (T8): The eighth thoracic vertebra is, together with the ninth thoracic vertebra, at the same level as the xiphisternum. Ninth Thoracic Vertebra (T9): The ninth thoracic vertebra may have no demi-facets below. In some subjects however, it has two demi-facets on either side; when this occurs the tenth doesn’t have facets but demi-facets at the upper part. Tenth Thoracic Vertebra (T10): The tenth thoracic vertebra has an entire articular facet (not demi-facet) on either side, which is placed partly on the lateral surface of the pedicle. It doesn’t have any kind of facet below, because the following ribs only have one facet on their heads. Eleventh Thoracic Vertebra (T11): In the eleventh thoracic vertebra the body approaches in its form and size to that of the lumbar vertebrae. The articular facets for the heads of the ribs are of large size, and placed chiefly on the pedicles, which are thicker and stronger in this and the next vertebra than in any other part of the thoracic region. Twelfth Thoracic Vertebra (T12): The twelfth thoracic vertebra has the same general characteristics as the eleventh, but may be distinguished from it by its inferior articular surfaces being convex and directed lateralward. The T1 and T12 vertebrae are the exceptions to this rule; T1 features a superior articular process resembling those of the cervical vertebrae, while the inferior articular process of T12 resembles those of the lumbar vertebrae. Reference: kenhub.com, innerbody.com, health.ccm.net, wikipedia.